Pelage: Pale tan, blond, gold, many shades of brown to black, gray or silver; grizzly's guard hairs pale at tips. Activity Cycle: Diurnal in North America (but active day and night when food scarce); largely nocturnal in Europe; in cold climates undergo winter dormancy. Social Groups: Lasting bonds only between female and young. Diet: Wide variety of plants and animals; diet more carnivorous than that of American and Asiatic black bears. Predators: Mainly humans; rare attacks in Siberia by tigers. Sexual: Female - 3.5 yrs; first cubs 4-8 yrs; Male - about 5.5 yrs. Feature: Rely on wide variety of seasonally available plant and animal food items: berries, pine seeds, grasses, roots, tubers, honey, ants, moths, small rodents, calves of moose, muskoxen, caribou, elk, and salmon. San Diego Zoo: In a new enrichment strategy as of 2010, exhibit spaces have been conncected for two young grizzly bears and an elderly Manchurian brown bear at the San Diego Zoo. The bears can now take turns using the whole area; this intelligent and highly curious species benefits greatly from added activities and a chance to smell tracks left by other bears. © 2010-2015 San Diego Zoo Global. Updated 2015. How to cite: Brown Bear (Ursus arctos) Fact Sheet. c2010-2015. San Diego (CA): San Diego Zoo Global; [accessed YYYY Mmm dd]. 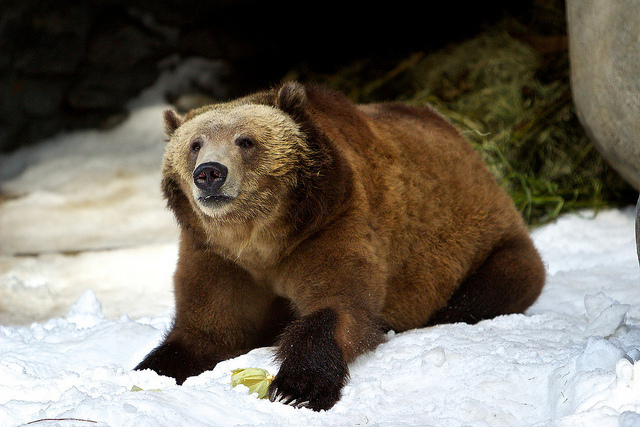 http://ielc.libguides.com/sdzg/factsheets/ brownbear.